Rather than the wide, open scenes along Alki Beach, I chose to draw the Alki Homestead instead. 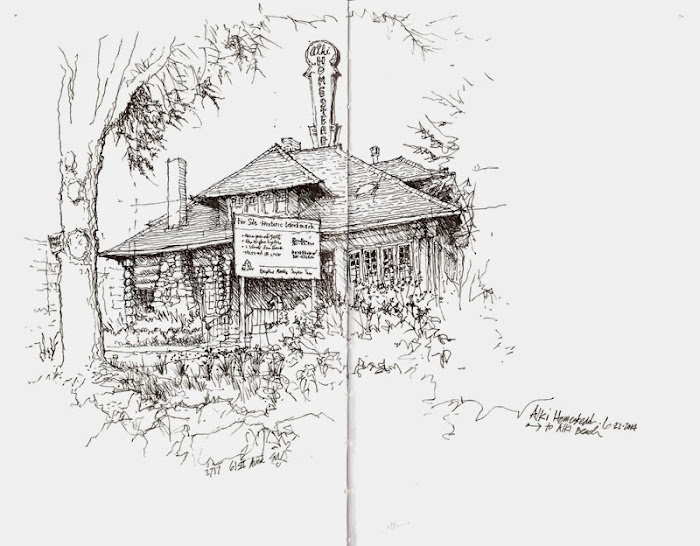 Originally built as a country estate—Fir Lodge—for Gladys and William Bernard in 1905, the log house operated as the Homestead Restaurant from 1950 to 2009, when a fire closed the restaurant. Because of plans to demolish the structure, the Washington Trust for Historic Preservation designated the log building as one of their Most Endangered Historic Properties. In 2010, a campaign by the Southwest Seattle Historic Society, the Washington Trust for Historic Preservation, and Historic Seattle persuaded the owner to sell the Alki Homestead. As you can see from the sign, it is currently for sale.